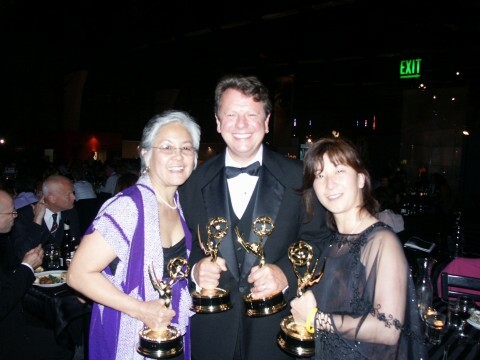 On Saturday, May 20, 2006, the National Academy of Television Arts and Sciences, San Francisco/Northern California Chapter, awarded the filmmakers of From a Silk Cocoon with an Emmy Award in the Historical/Cultural Program-Segment category. From a Silk Cocoon was one of the four programs nominated for the award out of the twenty-four total submissions to the category. The winners were announced at the Northern California Emmy Awards at the Palace of Fine Arts in San Francisco, and statues were awarded to Satsuki Ina (Executive Director/Co-Director/Writer), Kim Ina (Producer/Actress), Emery Clay III (Co-Director/Director of Photography), and Stephen Holsapple (Co-Director/Editor). The announcement, complete list of nominees, and complete list of winners can be found at www.emmysf.tv/. The Emmy is awarded for outstanding achievement in Television by the National Academy of Television Arts and Sciences. San Francisco/Noerthern California is one of the twenty chapters awarding regional Emmys. Northern California is composed of television and cable stations from Visalia to the Oregon border and includes Hawaii and Reno, Nevada. Entries were aired during the 2005 calendar year. 829 entries were received, in 63 categories, 226 were nominated and 66 received the Emmy statuette. "This documentary was made from the heart and soul of our Japanese American community. We want to thank all the volunteers, friends and families who provided time, labor, and support, all the former renunciants who opened closed doors during our research, and to all the individuals and families who suffered the trauma of the internment for their inspiration." The Telly Awards is the premier award honoring outstanding local, regional, and cable TV commercials and programs, as well as the finest video and film productions. The Telly Awards annually showcases the best work of the most respected advertising agencies, production companies, television stations, cable operators, and corporate video departments in the world. The Telly Awards is a widely known and highly respected national and international competition and receives over 12,000 entries annually from all 50 states and many foreign countries. The 27th Annual Telly Awards (2006) had a record 13,379 entries from all 50 states and around the world, and was the most competitive and successful in its long history. Stephen Holsapple, Satsuki Ina, and Emery Clay III receive Best Director Award from the November, 2005, New York International Independent Film and Video Festival! From a Silk Cocoon receives Grand Festival Award from the October, 2005, Berkeley Video & Film Festival!